The water at Del Valle has dropped immensely in the last few weeks, changing the lake dynamics and how to fish in it. The water temperature has been getting lower, dipping as low as 59 in the early mornings! Most days, the average sits in the mid to low 60s. Lots of bluegill and other sunfish are being caught right now! These fish are easy catches for young anglers. We recommend using some red worms for the sunfish. They will find them! Fishing shorelines and near weed beds is usually the best place to look for these sunfishes. You won’t have to wait long, the Bluegill are being very aggressive right now! Catfish are still here with many reports of catfish getting caught at the mouths of the coves, such as Badger or Bass Cove. The catfish are hanging out on the points because many of the normally submerged, fallen trees, are now out of the water with the lower water levels. Catfish are hiding in big reed patches, and feeding in muddier water, so keep an eye out for these locations. Anchovies and sardines are the best baits to use for catfish. 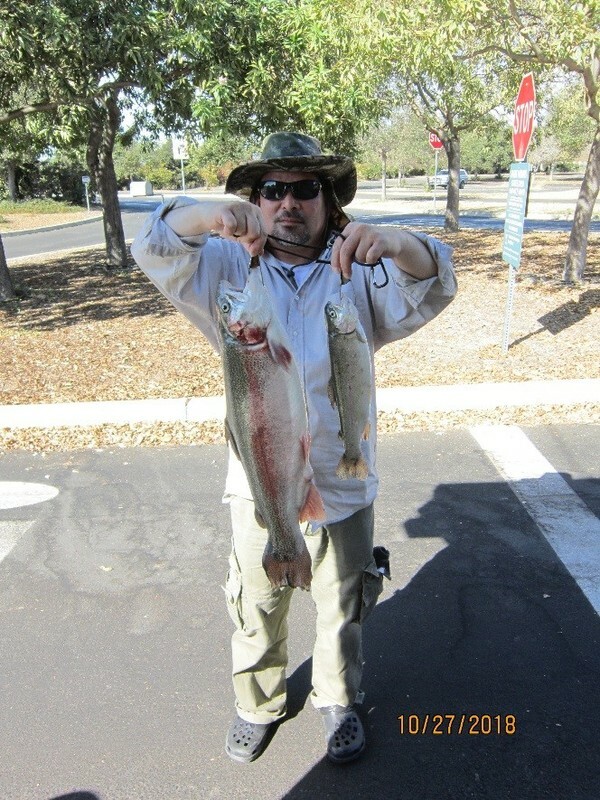 The trout are hitting lures! Many are being reported along the east swim beach shore. They are chasing mice tails like crazy. From a boat, we recommend fishing the coves in swallow bay. Troll some small jerk baits or toss a hot pink lure, which seems to be their favorite color. We have also heard that garlic Powerbait and red, white, and blue Powerbait are producing results as well. 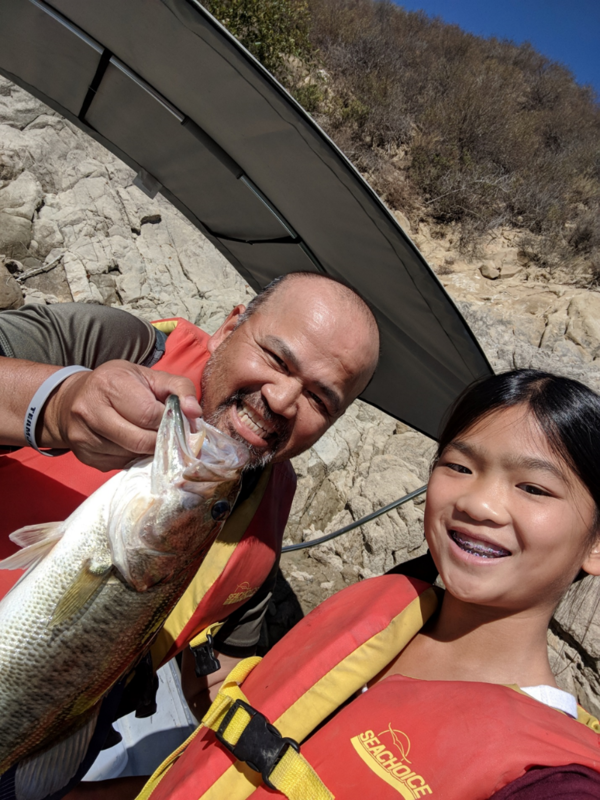 The bass bite is still the highlight at Del Valle! Many anglers are reporting hooking into smallmouth bass while working lures on the bottom. We recommend using small and slim Senkos and Kastmasters and other shad imitations, such as a smaller swimbait. The largemouth bass are hitting on rubber worms as well as fork tailed swimbaits on the top. Another recommendation would be slowly reeling nightcrawlers on the bottom. The largemouth are going crazy for nightcrawlers right now! They are hanging around in structure especially by the shorelines out in Heron Bay. If you feel like fishing slowly, you can also troll Panther Martins (1/8 oz or smaller) halfway down the water column. Striped bass are not biting very much this time of year. Some anglers are reported some luck with anchovies. We recommend fishing rock points or cliff walls with swimbaits or try vertical jigging.